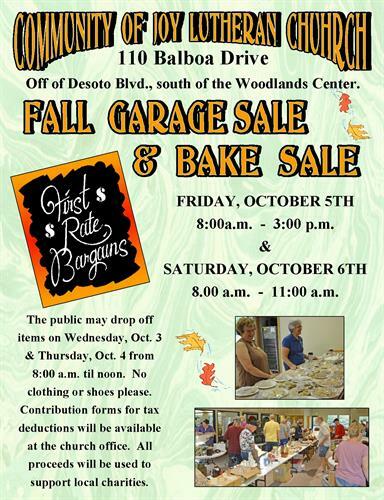 Community of Joy Lutheran Church, 110 Balboa Road, Hot Springs Village will hold a garage and bake sale Friday October 5th from 8 am to 3 pm and on Saturday, October 6th from 8 am to 11 am. The public can drop off items on October 3rd or October 4th from 8 am to noon. No clothing or shoes please. Contribution forms for tax deductions will be available at the church office. You will find household items, furniture, holiday decorations, bedding, books, glassware and so much more! All proceed will be used to support local charities.